This is a standard test of fear and anxiety in which the animal is placed in the center of an elevated 4-arm maze in which 2 arms are open and 2 are enclosed. Using a video camera, the rodent’s behavior is recorded by a blinded research observer. In addition to recording other behavior, the number of times the animal enters each of the arms and the time spent in each arm is noted. 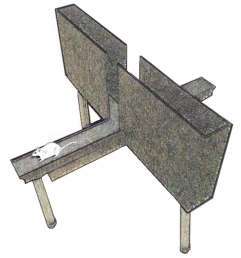 The elevated plus-maze is used to determine the rodent’s unconditioned response to a potentially dangerous environment and anxiety-related behavior is measured by the degree to which the rodent avoids the unenclosed arms of the maze. The test is particularly useful in testing the effects of anxiolytic and anxiogenic drugs.